Some people may claim that hormones and neurotransmitters are exactly the same due to their similar roles as messengers in the body. Also, these chemicals significantly influence behavior and both may have protein forms. However, these are considered different entities which facilitate several and specific physiological processes. Hormones are chemical signals secreted by the endocrine glands into the circulatory system which convey regulatory messages within the body. On the other hand, neurotransmitters are the brain chemicals that relay information throughout the brain and the body. Below are some of the distinguishing factors that will further clarify the confusion between the two. These include the amines and thyroxine as well as peptides to protein macromolecules. Their molecular structures and sizes widely vary. These hormones are synthesized from cholesterol. The only steroid type of hormones that are being produced by the major endocrine glands are adrenocortical and gonadal hormones. Neurotransmitters are endogenous chemicals that send signals across a chemical synapse from one nerve cell to the other “target nerve cell”, gland cell, or muscle cell and are primarily found in the nervous system. Neurotransmitters influence trans-membrane ion flow. These either increase or decrease the chance that the cell will produce an action potential. Excitatory neurotransmitters stimulate the brain and are somewhat overactive. They allow the postsynaptic neuron to produce action potential which increases the trans-membrane ion flow. Such neurotransmitters include dopamine, norepinephrine, and epinephrine. Inhibitory neurotransmitters help create balance by calming the brain. They decrease the trans-membrane ion flow, thus prohibiting the postsynaptic neuron to produce an action potential. Such neurotransmitters include serotonin, GABA (Gamma-amino butyric acid), and dopamine. Hormones are produced by the endocrine system while neurotransmitters are produced by the nervous system. The adrenals, pancreas, kidneys, gonads, thyroid, and other ductless glands secrete hormones while neurotransmitters are released from the terminal end buttons of neurons. Hormones relay signals through the circulatory system (blood stream) while neurotransmitters communicate signal across synaptic clefts. Since hormones function to reach distant “target cells”, the speed or signal transmission is much slower (can take minutes to days) than the neurotransmitters’ signal transmission which sends messages in between nerve cells (usually within milliseconds). Since hormones are transmitted through the blood stream, these act on distant sites from where these are produced. On the other hand, neurotransmitters are transmitted across the synaptic cleft, thus these react in direct proximity to their target cells. Hormones have diverse functions that affect physiological processes such as growth and development, metabolism, mood, sexual function, reproduction, etc. On the other hand, neurotransmitters facilitate transmission between neurons by passing action potentials from the axons to the dendrites. The hormones’ two classifications are “amino acid-based and steroids”. As for neurotransmitters, it can be classified according to ion flow facilitation: “excitatory and inhibitory” and according to structure (chemical or molecular): “small molecule and neuropeptides”. Hormones regulate specific organs and tissues while the capability of neurotransmitters is humbler as they merely stimulate postsynaptic neurons. Both hormones and neurotransmitters act as chemical messengers in the body. Hormones are chemical substances such as oxytocin, melatonin, estrogen, and testosterone which released by cells into the extracellular fluids to regulate the metabolic function of other cells and are produced by the endocrine system. Neurotransmitters are endogenous chemicals such as dopamine, glutamate, endorphin, and serotonin that send signals across a chemical synapse from one nerve cell to the other. The organ system of hormones is the endocrine system while that of neurotransmitters is the nervous system. 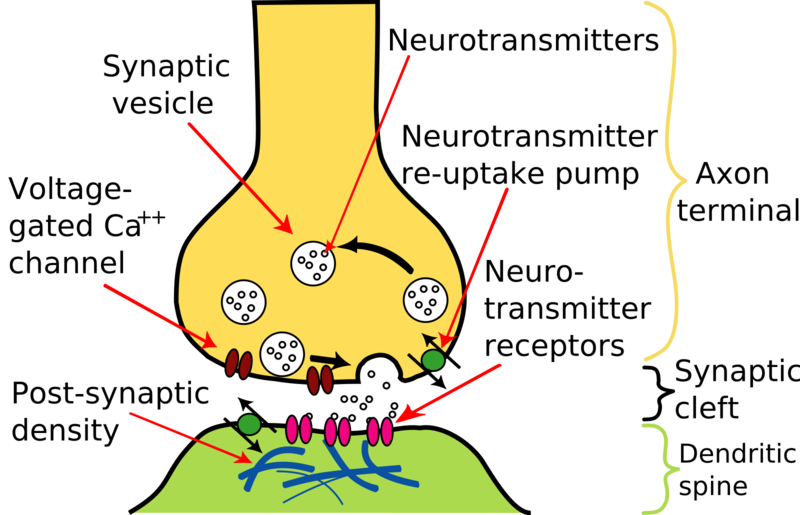 Hormones are conveyed via the blood stream while neurotransmitters are transmitted across the synaptic cleft. Neurotransmitters are generally transmitted faster than hormones. The transmission distance of hormones is farther as compared to that of neurotransmitters. Hormones are classified into acid-based or steroids while neurotransmitters may be classified according to ion flow facilitation (excitatory and inhibitory) as well as according to structure (small molecule and neuropeptides). Hormones regulate the target organs and tissues while neurotransmitters stimulate postsynaptic neurons. gene balinggan. "Difference Between Hormones and Neurotransmitters." DifferenceBetween.net. March 5, 2019 < http://www.differencebetween.net/science/health/difference-between-hormones-and-neurotransmitters/ >. Fink, George. Stress: Neuroendocrinology and Neurobiology. London: Academic Press, 2017. Print. Webster, Roy. 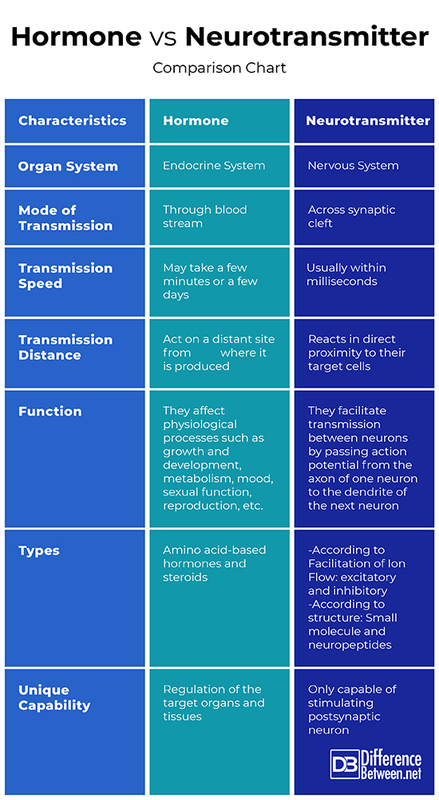 Neurotransmitters, Drugs, and Brain Function. New York, NY: John Wiley & Sons, 2001. Print.